Cupcakes 'n Daisies: Hallowe'en 1904 Update . . . . . So here's my latest progress on Hallowe'en 1904 by Blackbird Designs. 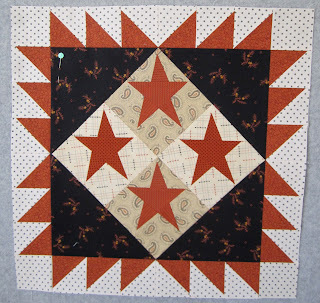 For the hsts on this block I went with the same orange fabric and same background fabric for all the pieces. 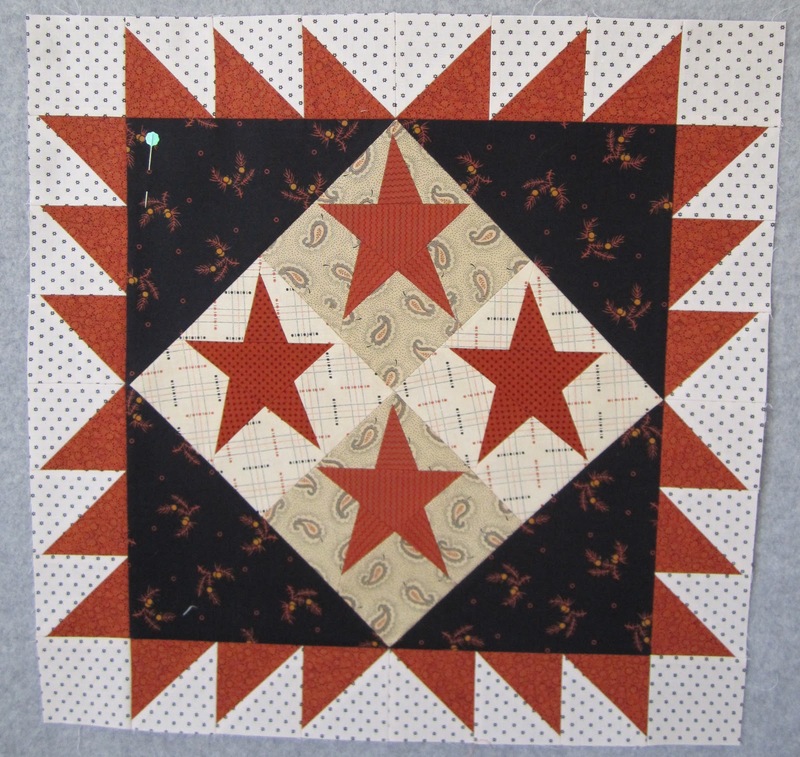 For the hsts on this block I went scrappy oranges and background fabrics. 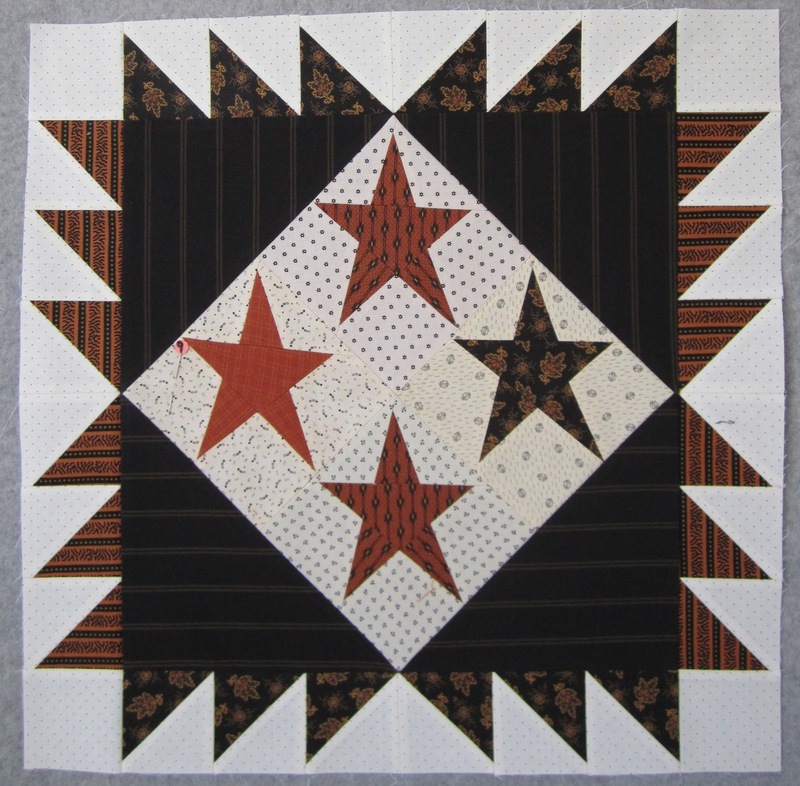 For this block I went with the same black and background fabric for the top and bottom and and for the sides the same black and background fabric, but fabric different from the top and bottom. 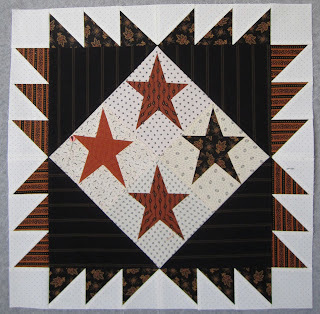 This is my favorite block so far, the pattern called for all orange hsts but I added a few blacks ones, for a combination of two different oranges, one black, and three different background fabrics. I've also made all the other star blocks except one. The remaining blocks are going to be scrappy hsts so I need to make a bunch of them before I can move on. A few folks commented last week that they didn't like that moon and star block, and I have to agree, it's not really one of my favorites either, but I'm leaving it in for now to see if I warm up to it. Nicole isn't using that block in her version, she's going with all pumpkins. I'm still enjoying this project and it seems to be going super fast! 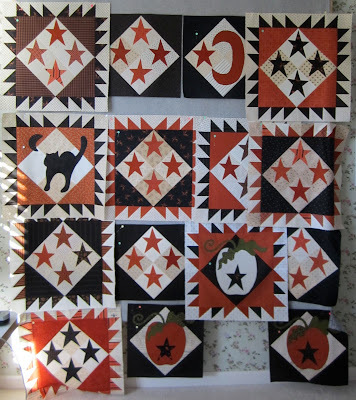 I,m not much of a Halloween girl but this quilt is really fun and love love how you are adding your own touches. Yup. That is the way those blocks are supposed to look. Wiping tear. Thelma, these blocks are just great! I love your choice of fabrics... my favorite is the orange and background scrappy. It's going to be a gorgeous quilt! I think you've convinced me that I need to make a Halloween quilt soon! :) It looks wonderful! Glad you're giving the moon a chance--it goes nicely with the stars. It is just whipping along! I'm with Donna on being pulled more and more into adding this to my Wish List! It's Tuesday? It is Tuesday, isn't it? Where are the tools? I thought this was Thelma's Tuesday Tool Time!! Bwaaaaaa! I'm not terribly fond of the shape of the moon...looks like a backwards 'C' (or if you flipped it the other way, it would like a grade C+), and with the star it looks like an emblem on a flag. If the moon was shaped more like the one on the black cat block I would like it so much better! Beautiful bounty of blocks Thelma! I have a tool to share, maybe one of these Tuesday's you could have a link in/favorite tool Tues. 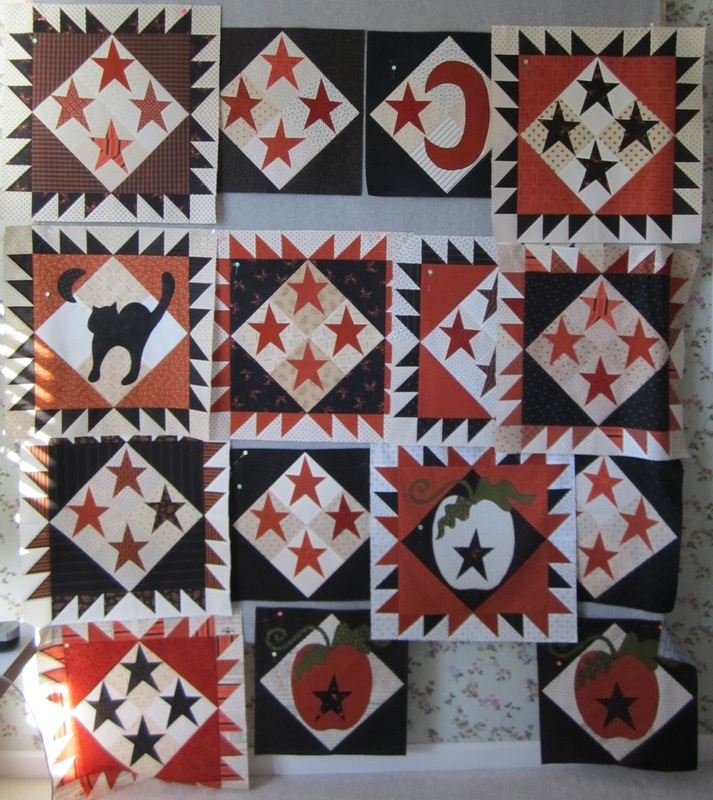 This is going to be the cutest Halloween quilt ever and I think the moon block just needs to be turned around to fit in with the others IMHO. Just super! I'm **SO** loving this quilt, Thelma! keep going! FABULOUS!!! I've always thought the moon looked odd, and when I do it, I was going to redraw it and overlap the star. Love also the white pumpkin!!!!! Great progress. I need to figure out a design wall. Love it! It is going to be perfect for Halloween.